DEF LEPPARD's second Las Vegas residency will take place this summer. The band will take over Zappos Theater at Planet Hollywood Resort & Casino for 12 explosive nights between August 14 and September 7. 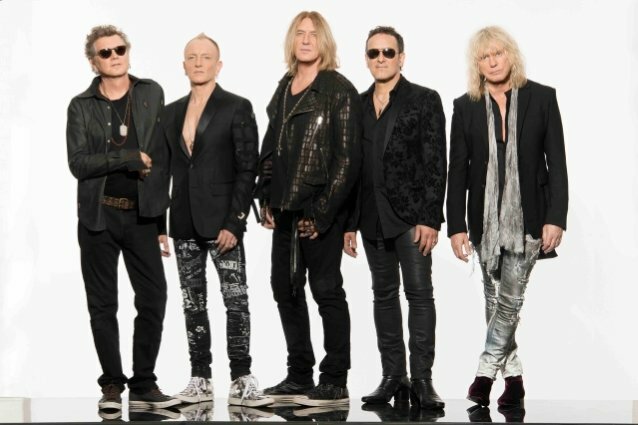 Commented DEF LEPPARD singer Joe Elliott: "Five years ago, we played our first-ever residency in Las Vegas which was relatively new ground for a rock band giving this kind of experience… I have to say, we really enjoyed it! Being in one place for the best part of a month is vastly different to our normal city to city touring routine. Breaking this cycle adds another element to the experience for both us and the audience. We look forward to seeing you at the Zappos Theater this summer!" Jason Gastwirth, president of entertainment at Caesars Entertainment, added: "Planet Hollywood transformed the entertainment landscape in Las Vegas with the first pop residency. We are proud to be at the forefront of rock residencies as well and treat the city's visitors to a new type of experience with DEF LEPPARD." All shows begin at 8 p.m. The band's first residency, "Viva Hysteria!" 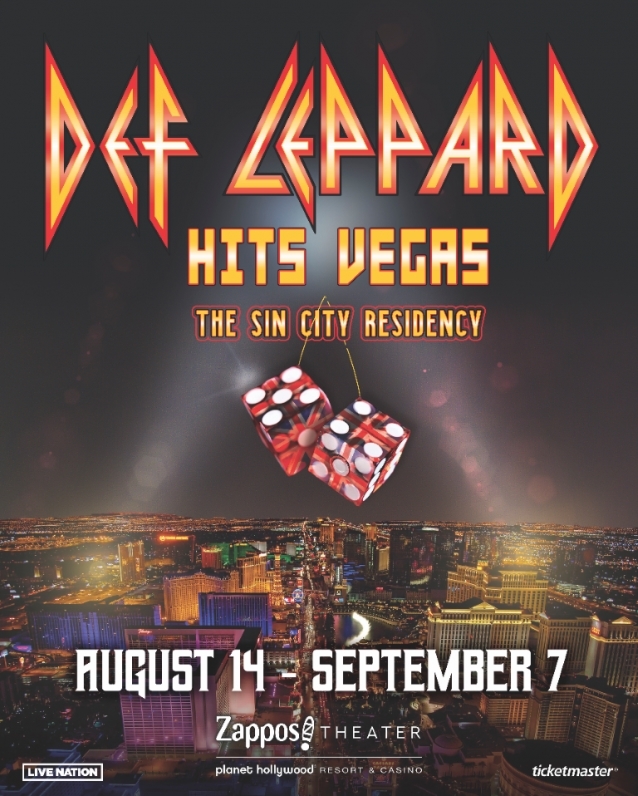 took place in 2013 and saw DEF LEPPARD spend a month in Sin City for a nine-show run at the Joint at the Hard Rock Hotel. The group performed its landmark 1987 album, "Hysteria", in its entirety at the concerts, which featured encores highlighting other material from DEF LEPPARD's 40-year career. Elliott offered more details about a second Vegas residency during a recent interview with the Japanese show "Masa Ito's Rock TV". The chat happened prior to the launch of DEF LEPPARD's tour of the U.K. and Ireland, where it also played "Hysteria" front to back. Speaking about DEF LEPPARD's return to Vegas, the singer said: "I don't think it's gonna be anything that's as specific as 'Viva Hysteria!' was, 'cause we're kind of doing that now. I don't think we're gonna be doing 'Viva Pyromania!' this time," he added, referring to possible full-album performances of DEF LEPPARD's third LP, 1983's "Pyromania". "We might do it one day — maybe we'll play more from it — but I think for the kind of venue that they want us in, it's more likely to be kind of a greatest-hits set. To be quite honest, we don't really know." Guitarist Phil Collen told the Las Vegas Sun in a 2017 interview that DEF LEPPARD's first residency "was great. We got to live in Vegas for a month," he said. "Honestly, I thought we’d get more time to do the stuff people come to Vegas for, see shows and all that stuff. But we were so busy. Because we were playing 'Hysteria' straight through for one set, we had 30 songs we had to get down and it was a very different experience. Doing the album was a bit more theatrical than the tour experience. But it's quite lovely at this point in your career to be able to do different things." DEF LEPPARD's brand new greatest-hits collection titled "The Story So Far - The Best Of", was released in November. The band will be inducted into the Rock And Roll Hall Of Fame this spring. The honor comes after the British rockers got the most votes in the Rock Hall's online fan poll.